Photo of expedition members joining FCD staff on Expedition to Nohoch Ch’en for a two week research project. Nohoch Ch’en is the largest sinkhole in the Chiquibul Forest. 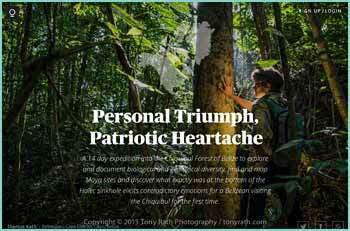 For a WONDERFUL and BEAUTIFUL photo essay entitled "Personal Triumph, Patriotic Heartache" on the expedition, click here (photos by Tony Rath). The purpose of the expedition would be to document one of the most remote, rugged and unexplored locations in Belize and to hopefully further justify to Belize and the world, the uniqueness and value of this region as a potential World Heritage site. The Nohoch Ch’en sinkhole, the largest of 49 collapsed doline formations that are located mostly over the Chiquibul Cave System, is located in an area where surface water is very scarce, making it challenging to explore for long periods of time. Very little scientific information was available for this region of the Chiquibul National Park, let alone the forest environment at the bottom of the 650’ wide and 450’ deep sinkhole. In the year 2000, several members of the Millennium Expedition descended by rope into the sinkhole and made brief observations, but time did not permit exploration and little data was collected, as this was not the main focus of their expedition. Jim spent months studying maps, making lists, planning every detail. He assembled a seasoned exploration team for the project: Jim Bevis, expedition leader, Marguerite Bevis (myself), camp nurse and communications coordinator, and our son, Arran Bevis, area exploration leader, have all led and outfitted expeditions into the Chiquibul since the early 90’s. Jim Allan, a world-class alpine climber and explorer, instructed and supervised the difficult technical climbs required. Neil Rogers is an adventure travel specialist who took the photo that inspired us all. Tony Rath, photographer extraordinaire, who’s well known images have attracted worldwide attention to the beautiful Jewel that is Belize, offered major support during the planning and implementation phase. Therese Rath, Tony’s lovely, vivacious, and energetic wife, was invited along to assist Tony and to cook, which she did amazingly. Bruce Holst, of The Marie Selby Botanical Gardens is perhaps the world’s top specialist in epiphytes and other tropical forest plant species. He has been doing research in Belize for over 20 years and has collected and catalogued over 10,000 species of different flora here. Bruce’s assistant, Ella Baron, founder of the Caves Branch Botanical Gardens, also became a part of the team. They would spend all day finding and mapping new specimens, and then work for hours in the evenings sorting, identifying and pressing, plus saving live specimens for various botanical gardens, including the National Herbarium in Belize. 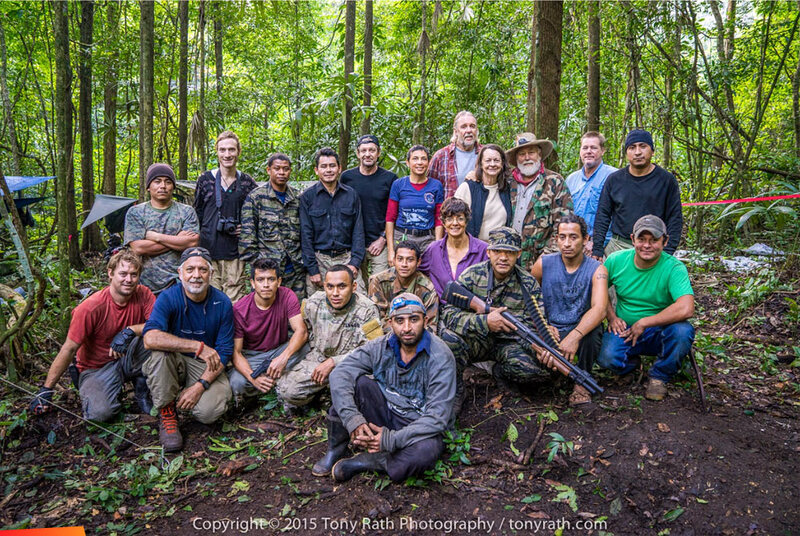 Other team members included Giovanni Martinez, level 3 rope rigger and natural history expert, as the rescue technician and lead medic; Nickolas Lormand, a film student from New Mexico; Joey Martinez, camp cook and “chain-saw Ninja”, when it came to clear the old logging road for the expedition to navigate deep in the Chiquibul; Hugo Orellano, camp cook and maintenance man; and Jairo ViaFranco, the “bush”mechanic who was able to fix anything and saved the day on several occasions. The FCD Rangers were essential team members. Gliss Penados and Boris Arevalo contributed significantly to the scientific component of the expedition gathering data and mapping areas by GPS. There were other FCD Rangers whose vigilance and knowledge of the area, made for a safe working and living environment. These are the brave sentinels of the Chiquibul. They kept guard day and night and reported their observations of the presence of potential intruders. Their dedication and commitment to conserving the Chiquibul is inspiring. Having loaded two trailers, one with supplies, the other with passengers, twenty team members began the journey on January 26, 2015 into the deepest parts of the Chiquibul Forest Reserve. We drove the tractors/trailers to FCD’s Tapir Camp where we spent the first night. We travelled the good road almost to Millonario but at that point, we had to reopen an old logging road for about ten kilometers to the base camp location at the pass below Nohoch Ch’en. Reopening the road took three days. On the fourth day, after hours of backbreaking labor, just before dark, we set camp at our final destination. MET donated a Weatherhaven 20’x20’shelter to FCD. This was an opportunity to instruct the FCD Rangers to set it up for use as a base camp facility. The tent housed a charging station for everyone’s electronics and was powered by a small generator for a few hours a day to charge the 12 volt batteries for continued use after the generator was turned off. A large table was in the center for food preparation and serving. Along the edges of this tent was storage for food and equipment. A water station was constructed to filter the dark tea-colored water brought from a Maya aguada every other day by tractor. After filtration the water was still slightly colored but purification drops were added for additional protection and nobody became ill.
On the first morning at the base camp, the scientists and photographers went to the top of the sinkhole for the first glimpse and images of this magnificent natural wonder. Others stayed in camp to set up the large shelter and a kitchen and build sanitary facilities. Thus began the daily routine of exploration and discovery. While some descended into the sinkhole by bosun’s chair, others continued to search for a source of water closer to camp and for an above ground entrance to the giant underground chambers of the Chiquibul Cave. The scientists were constantly at work searching for epiphytes, and they were excited by what they found. Dr. Holst found over 50 species of orchids alone. Specimens have been sent to Marie Selby Gardens. At the bottom they discovered large boulders covered with mosses, ferns, and orchids, and a profusion of epiphytes. Getting to the bottom of the sinkhole was not easy. A Harken winch helped to lower people down to a ledge about a third of the way down into the hole and then they could carefully make their way to the bottom. Each member was carefully harnessed and double checked for safety before descending or ascending. Team members discovered small shallow holes in the vertical walls all around the sinkhole. One small cavern could be seen from across the rim and at the entrance were large Mayan pots. Climbers spent a day and a half accessing this cave, to photograph the three large storage urns. What we know for sure is that the bottom of the sinkhole had not been explored or looted by modern man and it is extremely rich with various plants and epiphytes. Bruce Holst called the sinkhole and its rim, “exceptionally rich beyond words.”The only mammals seen in the sinkhole were Spider Monkeys that climbed effortlessly in and out of the sinkhole via cascading vines. A pair of Orange-Breasted Falcons were seen every day and are likely nesting in the sinkhole cliffs, but no nest was seen. Slate-colored Solitaires could be heard singing their incomparable flute-like song most days. There also appears to be Mayan ceremonial temples on the west and east rims of the sinkhole and temples with plazas were found for miles in every direction near the sinkhole hill. Ancient Mayan agricultural terraces were everywhere. It became evident that the Maya did climb down into the sinkhole to build ceremonial places to leave pottery or mementos, presumably to honor the dead. It is unlikely anyone lived there. There is no water in the bottom of the hole; however, possibly it was there in the day of the Maya. Nohoch Ch’en means great well and water was a precious resource then and now. There was an aguada at the base of a Maya site near our base camp, which still holds water today. There was very little water elsewhere - a few muddy puddles but no creeks, no rivers. Water is the major limiting factor in planning this and future expeditions. Also evident during the expedition, is that the area is heavily trafficked by intruders. There was a lot of Guatemalan branded trash around their campsites and trails. They are not taking just Xate; they are taking valuable hardwoods and wildlife and leaving behind garbage. The area is at risk of becoming one big Guatemalan milpa. The issues are complex and there is no simple answer. In order to protect the Chiquibul, FCD requires the finances to sustain the efforts on the ground. Concerned citizens at home and abroad can help by supporting FCD. To know more on how to help visit the www.fcdbelize.org website. The Chiquibul Forest is rich in biodiversity. The bottom of the sinkhole is a virtual time capsule of plant specimens and undisturbed Mayan relics. Mayan terraces and buildings abound. Consider that also within the Chiquibul Forest is the natural bridge, “Puente Natural” and the Chiquibul Cave System, the largest cave system in Central America, not to mention the Mayan city of Caracol. The Upper Macal and Raspaculo Rivers are nesting grounds for the endangered Scarlet Macaw and have an abundance of wildlife. Let’s not forget that these are the headwaters for the Belize River, possibly your drinking water. The Chiquibul Forest is important not only for Belizeans but for the world. It is our unique and irreplaceable natural and cultural heritage.